Video of Curry’s remarks can be found here or in the clip below. This year’s keynote speaker was Gary Haugen, chief executive officer of International Justice Mission. Haugen described working as an intern with South Africa Archbishop Desmond Tutu when Tutu was a leader in the movement to end apartheid. He spoke of faith’s ability to triumph over forces of division. And, citing the cause championed by his organization, he called for action against human trafficking, forced labor and other forms of modern slavery. Curry received a burst of international attention and acclaim last year when he preached at the royal wedding of Britain’s Prince Harry and Meghan Markle, a sermon that focused on the power of love. His appearance at the National Prayer Breakfast provided him an opportunity to apply that message of love to a different context. “Paul saw what Jesus meant,” Curry said. 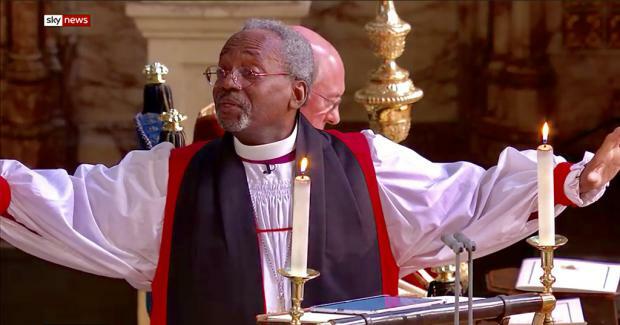 “That way of love can set us all free.” He closed his remarks by quoting the traditional black spiritual “There Is a Balm in Gilead,” a common refrain in Curry’s sermons, including in his royal wedding sermon.